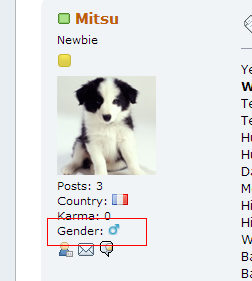 Ones Username will usually tell other members your gender but in many cases Usernames are ambiguous. Click on Profile from the Top Menu or your Avatar under User Info on the left side menu. Save your Profile, Bottom Right. Your Gender will now appear under your Profile.